Diwali the world over is known as the festival of light signifying the victory of light and all things good. 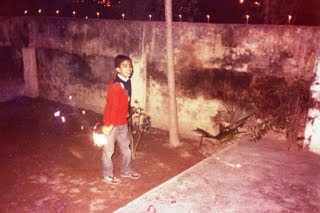 The festival was one of Anuj's favorite growing up. His infectious smile seem to brighten up that much more when it was Diwali time as he decorated the house with brightly colored candles and tea lights, playing with multicolored fireworks and passing out sweet treats to friends and family. Anuj lighting up the world with the Goodness of his heart and Diwali Candles. October 1988.